We received a lot of responses to the Jazz 100 list that was created at the beginning of the year, based on your votes for what you thought were the best jazz songs of all time. Perhaps the most exciting response we received was in video form recently. Carlos Rhodes, a very dedicated listener, compiled all 100 songs on video. Check it out by clicking here. Miles Davis would have been 85 years old today, and the birth of the legendary trumpeter is being celebrated in several ways and places around the country today. When LIFE photographer Robert W. Kelley snapped a few rolls of film at an intimate jazz gig on May 14, 1958, neither he nor the magazine’s editors could have known the importance of what he had witnessed. Perhaps that’s why Kelley provided only scant notes — just the date and the city and the subject’s name, “Miles Davis” — scrawled on the small archival file of the images; perhaps that’s why the bulk of them, which capture trumpeter Davis, then just 31 years old, leading his band in an unnamed New York venue, never made it to print. To see these great photos, head to LIFE.com. East St. Louis, where Miles was raised from the age of one, is celebrating today. A free family event will include a “likeness”-adorned cake; jazz by Reginald Thomas and the 85th Birthday Jazz Ensemble; “Milestone: The Birth of an Ancestor,” a poetic elegy/multimodal exhibit by ESL poet laureate Eugene B. Redmond (and Soular Systems Ensemble); and reminiscences by Miles’ high school classmates and childhood friends, all at the East St. Louis Municipal Building. Trumpeter Wallace Roney celebrates tonight with a tribute at Zinc Bar with three shows. Roney calls Miles his idol, greatest teacher, and biggest influence on his life. Also, the Harlem Arts Salon is hosting an invitation-only event tonight called “Reflections on the Legacy of Miles Davis” with Kelvyn Bell, Quincy Troupe, SOUNDART, Christopher Janney, Anthony Barboza and more. 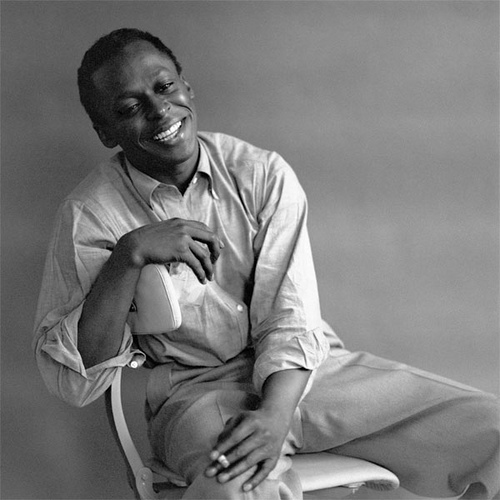 If you can’t find a local Miles celebration happening, go out and buy yourself a new Miles Davis compact disc that maybe you haven’t heard before, or dig up and old recording from your collection that you haven’t listened to in a while. Below, enjoy live performances of So What and Tutu. The end of 2008 was a tough time for me as it related to jazz, primarily because the jazz world lost Freddie Hubbard due to complications from a heart attack right before 2009. As a trumpet player myself, Hubbard was my biggest influence, but he also struck me as a “survivor”. Both Clifford Brown and Lee Morgan were lost before their time, and Freddie tore through the 70’s with mind-blowing recordings (both live and studio) when jazz needed a trumpeter to be mind-blowing. I swear to you, I learned how to solo from Hubbard’s recording of “Birdlike”, realized how much harder I needed to work when I heard “Red Clay” and “Straight Life”, and found out how I had no chance of being truly good (yet always inspired) after listening to his Live at the North Sea Jazz Festival recording from 1980. While things might have declined for Hubbard both personally and professional after that, I always held the special things he did in his prime close to my heart. In situations like this, you always hope there is more. You don’t want him to leave this earth with a few sub-par albums that he struggled through and assume that was it. For those who have longed to come across some unheard gem from Freddie (and I certainly was one of them), then Pinnacle: Live & Unreleased from Keystone Korner is like that unopened Christmas present that had been forgotten about in the closet for several months until it was wandered across. 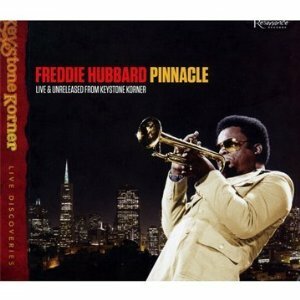 Pinnacle: Live & Unreleased from Keystone Korner features live recordings from June and October of 1980, and offers everything a fan would want if they were to be handed a CD from someone who said “Hey, I found some previously unreleased live Hub for ya.” Certainly not polished or commercial enough to ever get a spin on radio, but filled with life and personality that reminds you of why he was so great to begin with. With this CD, I was actually glad that it wasn’t perfect, at least in the studio quality sense of the word. There are hints of distortion from time to time, but that helps me actually picture Freddie playing with the bell of his horn encompassing the microphone. The balance is off from time to time, but it helps me actually picture the rest of the band around and behind him up on a stage. And his improvisation is as good as it always was, offering speed, tone, creativity, and range on all tracks, helping me once again refresh my mindset of one of the most talented jazz musicians ever. For those of us from the Pacific Northwest (and in many cases, beyond), this recording offers even more sentiment, as a few of the tracks feature the late Seattle favorite Hadley Caliman, who passed away at the end of 2010. To hear Freddie and Hadley tear it up on “Giant Steps” brings back wonderful memories of two talents gone but not forgotten. This is a great album that should be added to your collection, but do yourself a favor and purchase the actual CD, rather than a digital download. 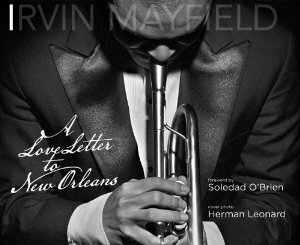 The liner notes are exceptional, and feature wonderful photos of Freddie and Hadley, as well as Larry Klein, Eddie Marshall, Billy Childs, David Schnitter, and Phil Ranelin, who make up the rest of the musicians on this release. Fans of Freddie Hubbard should treat this release as a collectors item and something to smile about versus something that comes up on an Mp3 shuffle. Highly recommended. 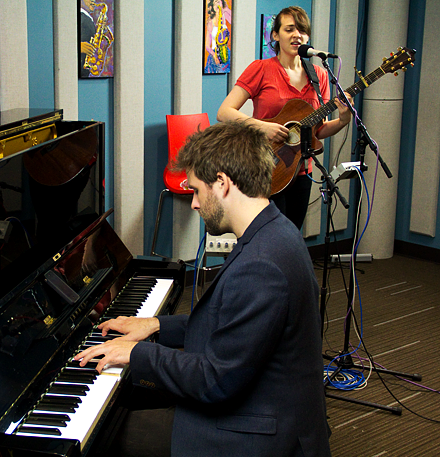 Pianist Taylor Eigsti and vocalist Becca Stevens stopped by our studios for a live performance and interview. Below is audio of the session, photo, and video. Pianist, Taylor Egisti and vocalist/guitarist, Becca Stevens, stopped by the KPLU Seattle studios on May 16th to brighten an otherwise rainy Monday afternoon in the Pacific Northwest with an performance and interview, hosted by Evening Jazz host Abe Beeson. Both artists are in the process of building strong solo careers for themselves. However, their paths crossed frequently in the New York jazz community and they soon found that their individual approaches to jazz were compatible and inspiring. 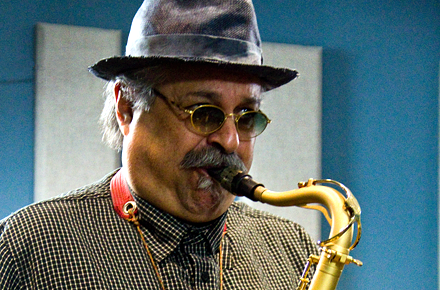 They began performing together from time to time and recently recorded together (Stevens is featured on Eigsti’s latest CD, Daylight At Midnight). In this Studio Session they performed duet versions of two songs from Eigsti’s, Daylight at Midnight, and two songs of Becca’s CDs Weightless and TeaBye Sea.